Dwayne was watching an episode of 24 on Netflixs the other night. It's an entertaining show, if you can get past the unrealistic plot. How is it that one man is always in the right place at the right time to save the world again and again and again? I wasn't all that interested in watching, so I was blogging instead. But, I looked up from my laptop when I heard Dwayne start ranting. He was talking to the TV, so I looked in that direction. The screen was flashing back and forth between Audrey in the office and Jack in his truck. (The two have had an on going romance during the last few seasons.) In this particular scene, Jack was waiting to meet with the President's Chief of Staff about something. I'm guessing it was important, had less to do with a round of golf and more to do with saving millions from the threat of terrorists armed with nerve gas. But, Audrey had just found out Jack was alive after thinking he'd been shot at the end of last season and she had just been confronted by the woman Jack had been living with for six months while he was pretending to be dead. So, she felt compelled to call him, for some reason. But, Jack never does have a lot of time, the clock is always ticking, as you know, so he couldn't stop what he was doing to talk about their relationship right then. The scene I was watching ended this way. Then they both hung up. And that is when Dwayne and I looked at each other and after a brief moment, busted out laughing. I can't tell you how often I used to call Dwayne at work, eager to talk about something very serious or personal. But, he's always busy there, for some reason, so he was never focused or caring enough in his tone. There was always a suspicious delay before he gave vague responses to what I said and I had to repeat things, a lot. That always made me mad, so I'd say something inflammatory, accusing him of not listening to what was important to me or putting his family first or something like that. He'd usually take my bait and we'd end up fighting. Well, it's been months, maybe closer to a year since I've called Dwayne at work for anything other than, “When will you be home?” because “I need to know when to have dinner ready.” He always responds clearly to that question. I save everything else for another time, everything. I guess I've taken the approach the woman in the Old Testament did when her son died of heat stroke. She didn't even bother to tell her husband the truth when he asked why she was saddling up her horse to go get the prophet of God. She knew her husband had plenty to do in the fields harvesting their crops. She just handled the entire thing herself. I guess I've been inspired by her faith and "can do" attitude. And, while it may seem like handling things myself is a means of maintaining control, for me, it is actually a matter of submission. Dwayne always encouraged me to handle things myself, always wished I respected the responsibilities he had at work enough not to bother him with matters he left me at home to handle anyway. So these days, I try and handle everything that happens "on my shift" by myself. Though, I may actually draw the line at following that woman's example and go ahead and call Dwayne at a death or even a less-than-fatal trip to the emergency room. Hi! I've given you a blog award - stop by and check it out! Hey, thanks! I am going to pass on the love in a future post. ;) And, I read all the blogs you listed and I found some that are new to me that I really like. Thanks! Yeah Gina. This one took me years to figure out. Poor man. ;) Though, I didn't put it in the post, but Dwayne DID say he's starting to feel unloved cause I don't seem to care to involve him in anything. LOL. Can't win for loosing. 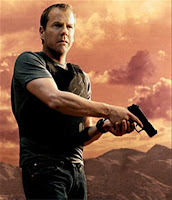 In my dreams at night, I look just like that picture of Jack Bauer.